Set includes four 500 piece puzzles each measuring 18" x 24"; Cottage Twilight, Serenity Cove, Valley of Peace, The Village Inn and a free poster. 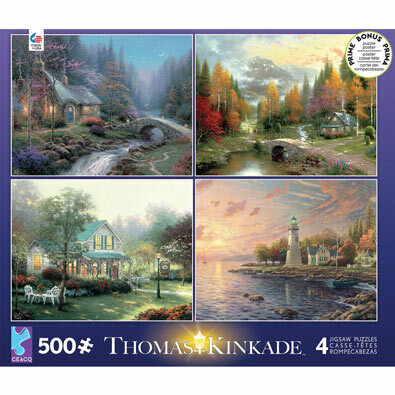 This 300 large piece jigsaw is designed by Thomas Kinkade and measures 18" x 24". • 300-piece jigsaws offer a good balance between fun and challenging puzzle experiences. This 550 piece jigsaw puzzle is designed by Thomas Kinkade and measures 24" diameter. • 550-piece puzzles off a medium challenge for puzzle fans.